When talking about physical media, the first thing that comes to the mind of most people would be how fragile they are. If you don’t handle them with extra care, you would find scratches on your CDs and DVDs starting to accumulate. And as a better and more advanced version of DVDs, Blu-rays are supposed to be more durable than DVDs, and it is. It’s much harder to leave a scratch on a Blu-ray disc than on a DVD. But does that mean Blu-ray discs are completely scratch-resistant? Not really. Through Blu-rays are claimed to be tougher than DVDs, people still found scratches on them during daily usage. 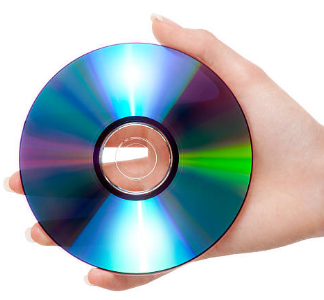 It still requires you to be careful when handling them in order not to scratch or damage the disc. The fragility of physical media makes it really hard for us to keep them in good working condition. But if you are not satisfied with what the streaming service providers are offering, physical media is still the best choice you can have for the highest quality of movie viewing experience. In order to keep your Blu-ray discs in good working order, you are going to need to pay more attention to the way you handle them. But it’s inevitable to have scratches, dust or grease on your Blu-ray discs. So it’s important to learn how to clean a Blu-ray disc properly. Also, you should know how to properly handle your Blu-ray/DVD disc to try to avoid dust, smudges or even scratches. Handling them properly would greatly reduce the risk of getting them scratched. The right way to handle them would be to hold them by the edges or the hold in the center of the disc. Try not to touch the side from which the laser reads or put this side against any surfaces that might scratch it. If you accidentally touch the disc with your fingers, you might leave fingerprints on them and the resultant oil and grease might cause playback problems. Fingerprints are one of the most common kinds of smudge that can be found on a Blu-ray disc. Technically it’s the laser that reads the Blu-ray disc and the fingerprints usually won’t interfere with the reading of the disc so it might not have any real damage to the disc. But some people might not like leaving them on the surface of the disc. And if you touch the disc with a, say, popcorn covered hand, it could affect the playback of the disc. Other than fingerprints, dust can also damage the disc. With dust accumulating on the surface of the disc, it will cause scratches when you put it in the Blu-ray player. Not to mention it makes cleaning the disc really hard as it can scratch the disc severely if you are not cleaning it in the right way. So to reduce the possibility of damaging the disc, always store the disc in its storage case or sleeve when not used. When you do find the needs to cleaning the disc, below is how to clean a Blu-ray disc. The cleaning materials are not that hard to find. 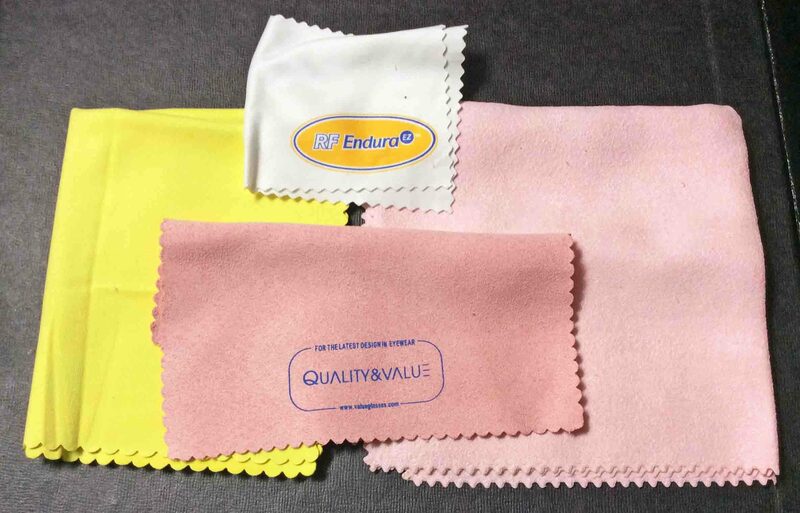 Most of the time, several pieces of clean, soft, anti-static microfiber cloths would be sufficient. The reason why you should use them to clean a fragile surface like the Blu-ray disc is that they can remove the fingerprints or dust on the disc without leaving scratches on the disc, provided that you are not doing it the wrong way. If there are too much debris on the surface which can’t be cleaned by using a clean cloth, you might need to get a disc cleaner kit for that. Usually a disc cleaning kit would include a cleaning solution safe for the discs and some additional products that can fix the slight scratches on the disc. It’s not enough to have the right material for cleaning the disc. You should also know the right technique for cleaning the disc. If the cleaning job is done in the wrong way, you might end up with more scratches on your disc. 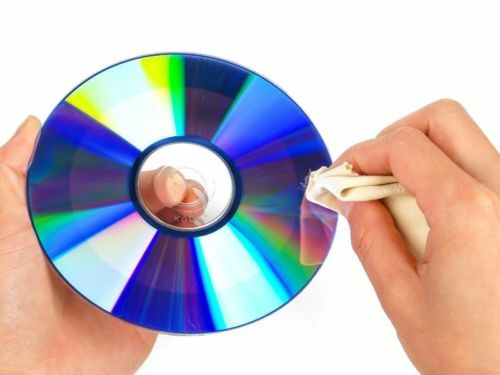 Blu-ray discs are not as fragile as DVDs or CDs, but you should still wipe them gently when cleaning them. Start wiping the disc from the center of the disc to the edge. Avoid wiping it in a circular motion as you would leave scratches that cannot be repaired on the disc when rubbing the disc this way. Scratches can be fatal to the playback of the Blu-ray disc and that’s why you should pay more attention to handling them to avoid scratches. Scratches will cause the playback to skip or even stop, which makes the viewing experience awful. Luckily, some small scratches can be fixed. You can try either a disc scratch repair cream or a scratch remover machine to help you repair your scratched discs. So when you have a damaged Blu-ray disc with scratches and the playback is filled with skips and pauses, try fixing the scratches on the disc first before you decide to toss it away. Blu-ray discs are by no means cheap. After investing so much money on them, you might not want to see them getting scratched and fail. You might have tried your best to protect them, but there might be accidents that would cause permanent and severe damage to the disc. To avoid losing the Blu-ray movie forever, a backup of the discs is always suggested. There are several different forms of backup you can make. 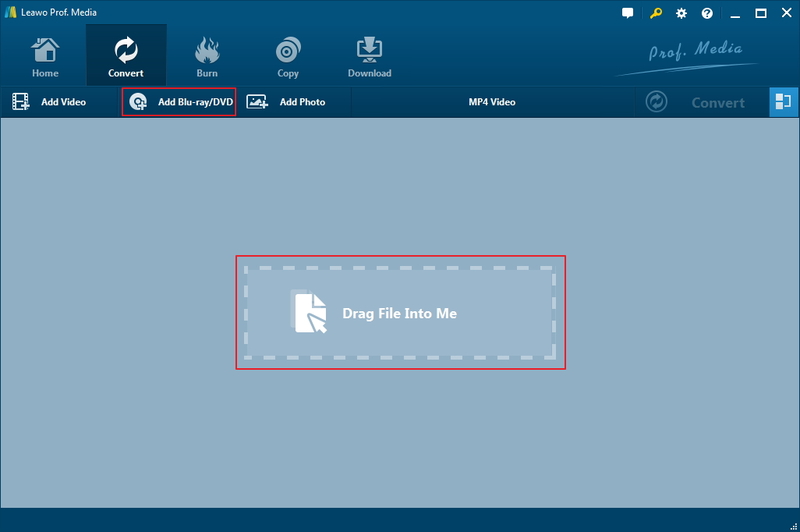 First off, you can try copying your Blu-ray movies directly to another re-writable Blu-ray disc to make an exact copy. Also, a digital video file would be a good way for backing them up. You can watch them whenever you like on your computer or transfer them onto your mobile devices to watch them conveniently. And you can burn them to a new disc when you need a new Blu-ray copy. The key to backing them up as a digital video file lies in the quality. The quality is the most important part in making the backup. If the Blu-ray data are compressed when making the digital video, then there will be quality loss and the new disc you make from the compressed video won’t be as good as the original disc. So the key is to make a lossless digital copy from the original Blu-rays. With that in mind, I would like to recommend to you Leawo Blu-ray Ripper. 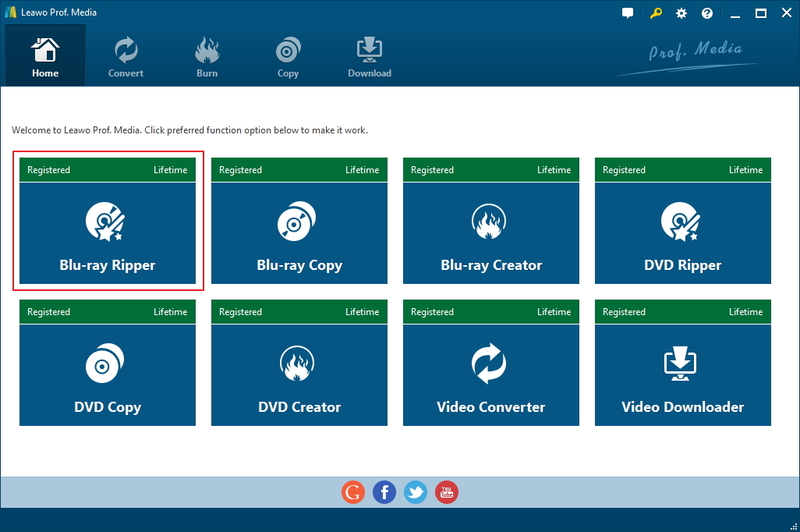 The program is a versatile Blu-ray converter capable of converting Blu-rays to MP4, AVI, WMV, lossless MKV and most of other popular video and audio formats you can think of. The lossless MKV format the program offers would allow you to convert your Blu-rays into a lossless MKV video with no compression. It ensures that when you use the MKV video to make a new disc, the quality of it would be just as good as the original one. Follow the instructions below to use Leawo Blu-ray Ripper to rip Blu-ray to lossless MKV. Note that Leawo Blu-ray Ripper doesn’t function as a single program but is bundled inside a big software suite called Leawo Prof.Media along with 7 other modules. Step 1. Launch Leawo Prof.Media and on the interface the program will directly show you the shortcuts to all 8 modules inside it. The Blu-ray Ripper shortcut icon is the first one on the top row of icons. Click on the icon to see the module’s main interface. Step 2. Enter the original Blu-ray disc to your disc drive. 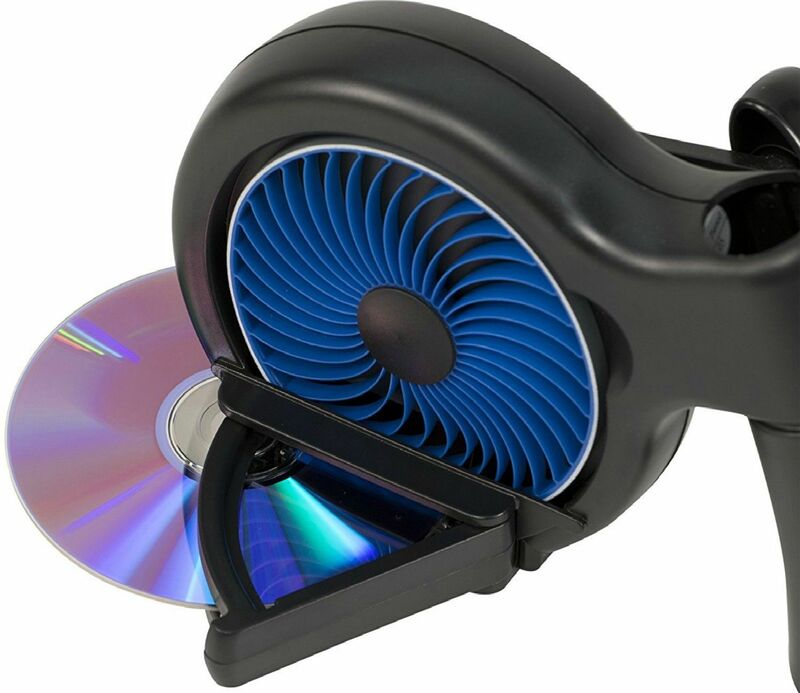 Make sure the disc drive you use is capable of reading and playing Blu-ray discs. Wait for a few seconds for the computer and the program to detect the disc. And then you can start to import the Blu-ray data to the program by clicking Add Blu-ray/DVD>Add from CD-ROM>[Blu-ray disc title]. Step 3. The next step is to pick the videos in the disc to rip and convert to MKV. Usually there are more videos other than the movie itself like some behind-the-scene video footage or bloopers included in a Blu-ray disc. The program offers you with the option to select the videos you want and have the unwanted videos excluded from the conversion. Click the Full Movie to convert all the videos. Click Main Movie and then the program will automatically pick out the longest video in the disc. The video with the longest duration is usually the main movie. But you do have the option to select a new video from the video list for conversion. Custom Mode allows you to select multiple videos from the video list. The videos on the list can be played and previewed with the video player on the right side. Just select one video and click the Play button on the window to play that specific video. Click OK after choosing the videos you need to add them to a new video list. Step 4. Leawo Blu-ray Ripper offers plenty of output formats and you need to manually set lossless MKV as the default format for the output video. There’s a button above the video list that shows you what the current default output format is. This format button is on the left side of the Convert button in green background in the upper-right corner. Click on this format button to see a new menu and continue to click Change on the menu to open a new panel where you can see all the video and audio formats you can choose. 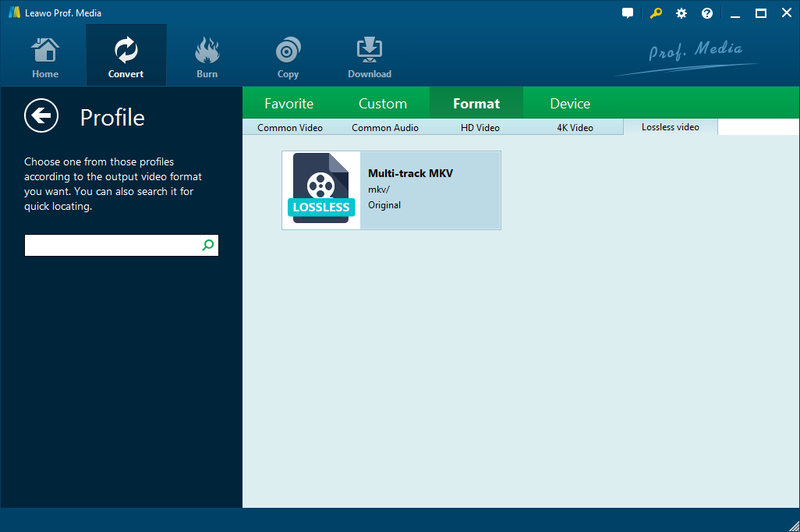 On the format panel, click Format>Lossless Video and when you see the Multi-track MKV profile, click on it to make it the default format. You will find yourself back in the video list after selecting the lossless MKV profile. Step 5. Click the green Convert button and a new panel will show up. On it you can set where to save the output lossless MKV video in the output path box. Use the Convert button at the bottom of the panel to start converting the Blu-ray movies to lossless MKV when you are ready. Here’s a brief video guide to show you how to convert Blu-ray to a common video file using Leawo Blu-ray Ripper for your reference. If you like watching movies on Blu-ray and collecting Blu-ray discs, it’s important to know how to clean a Blu-ray disc as well as how to protect them properly. And backups of your Blu-ray collection is highly recommended and worth considering.